Egner, et al vs E. C. Schirmer Music Co.
1st Cir. (12-29-1943) ¤ 139 F.2d 398, certiorari denied 64 S.Ct. 947, 322 U.S. 730. 88 L.Ed. 1565. “The Caisson Song” (aka “The Caissons Go Rolling Along”) was composed by Edmond L. Gruber about 1908. He assigned rights much later (1921) to Egner and Mayer. Egner & Mayer published the song June 8, 1921, and copyrighted it August 10, 1921. Gruber’s assignment stated that the song was to be allowed to continue being published in the Manual of West Point Songs (which was not an Egner & Mayer publication). Egner & Mayer reassigned the rights on or near January 23, 1936, preserving the right on the West Point compilation. On February 6, 1936, Gruber assigned “all his rights, title and interest” in it to Shapiro, Bernstein & Co. (also a plaintiff). The defendant was a rival publisher who denies infringement, and said that the song dates to the Civil War, which makes it public domain. This could not be established. However, military personnel had used the song circa 1917, the year that celebrated military-march composer John Philip Sousa incorporated most if not all of it into “The U.S. Field Artillery March.” Gruber was himself a military man (eventually a Brigadier General), so he should have known of Sousa’s version, thus “a publication by such an eminent composer, not having been objected to by Gruber, constituted a practical abandonment by Gruber to his rights to a copyright.” Gruber didn’t object to any unauthorized use of the song until 1930. The defendant had first published the song in 1921, in a book called The Home & Community Song Book. Other unlicensed publishers had published the song, too. “All in all, the history of this song shows that it was early in its life dedicated to public use.” Gruber’s 1930 copyright was not the first copyright, in that there was Egner & Mayer’s 1921 copyright on their compilation. (On appeal, it was claimed that the 1930 copyright was only for a bugle arrangement.) Although it was argued that Gruber intended to give Egner & Mayer the right to publish rather than an outright assignment, the distinction was moot: the copyright was invalid by reason of the song having already entered the public domain through abandonment. Mr. Klasmer and Jo Lombardi composed a song for the Colts football team. Klasmer deposited an early version of the song (on July 12, 1947) and the final unpublished version (July 23, 1947). A certificate was issued each time. An agreement was made between the authors and the Colts whereby each side would receive half the profits from sheet music and records. Now named “The Baltimore Colts Official Theme Song,” it bore a copyright notice of “Copyright 1947 by the Baltimore Colts, Jo Lombardi and Benjamin Klasmer.” The authors knew of this wording prior to publication and did not object. No deposit was made of this final version to the Copyright Office until December 1959. Band arrangements were prepared and were issued to the Colts band, the Colts volunteer band and to high schools, not just in Baltimore but also in cities where the Colts played. No notice was on these separate sheets. “The evidence also shows that Klasmer and Lombardi knew that the song was being played by bands and orchestras from memory, or from unauthorized transcriptions at all sorts of functions in Baltimore from 1947 on, and that they made no objections… . [T]he failure of Klasmer and Lombardi to take the necessary action to protect the rights which plaintiffs now seek to assert shows that in 1947 they were not interested in protecting any rights they may have had beyond sharing in the proceeds of the sheet music and of any records which might be put out by the Colts. 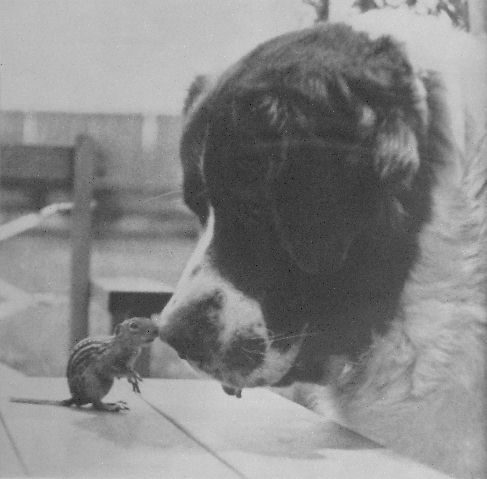 Fritz Conner vs Mark I, Inc. and April House, Inc.
Conner’s photo of a St. Bernard playing with a chipmunk was first published in the September 24, 1961, edition of the Columbus Dispatch; neither that edition nor the photo was copyrighted. Conner then licensed this “Dispatch Photo” to Life Magazine for publication in its October 20, 1961, issue, which was copyrighted. Conner licensed the photo again (to different parties) several times. April House (later purchased by Mark I) distributed a memo pad, a poster, and other items reproducing the photo, without authorization. In that the Columbus Dispatch appearance was a “general publication,” on its first publication the photo had been placed in the public domain. Thus, Paramount won, “pending the final determination of this action,” an injunction against Carol Publishing and Sam Ramer (and those associated with them) “printing, duplicating, publishing, distributing, marketing, advertising, promoting, soliciting or accepting orders for” their book. Houghton, Mifflin & Co. vs R. H. White Co.
Oliver Wendell Holmes, Sr., was a revered writer and poet whose son had recently joined the Supreme Court when this case went before it, yet such advantage could not regain for his estate the copyright lost through carelessness. A book of his essays entitled Professor at the Breakfast Table entered the public domain. F. Collis Wildman vs New York Times Co.
D.C.N.Y. (11-19-1941) ¤ 42 F.Supp. 412, 51 USPQ 530. The would-be copyright owner printed and sold 3,000 copies of a verse titled “Remember This” on a card containing the word “copyright” but without giving copyright date. “At the end of the verse, at the right, is the name ‘F. Collis Wildman.’ In the lower left corner of the card is printed the word ‘Copyright.’” No year is given. The copyright registration certificate was received by him on or about July 3, 1926. “With the [statutes] in mind, I can only come to the conclusion that the plaintiff, when he had printed and sold the cards, in 1926, dedicated the verse to the public. I can only conclude that there was no sufficient or legal copyright notice attached. There was no date attached… . “Plaintiff, as a result of the defective notice of copyright, has dedicated the verse, ‘Remember This,’ to the public and cannot maintain an action for infringement of copyright”. The creator of Superman comic strips contracted with a newspaper syndicate to offer the creator’s strips exclusively to the syndicate for five years. By contract, the strip was to be copyrighted in the publisher’s name, but the copyright would revert to the creator at release of the strips so that they could go to Action Comics after six months. (This made the publisher a “proprietor” of the intended copyrights.) The publisher failed to put copyright notices on the strips (both on first publication and in reprints). With the works falling into the public domain, the creator lost the copyrights on these strips he otherwise would have enjoyed. illustration: from the Superman cartoons produced by Fleischer from 1941 to 1943. All 17 shorts entered the public domain for lack of renewals. Continental Casualty Company vs Hulbert T.E. Beardsley and H.T.E. Beardsley, Inc.
“In January of 1939, Beardsley had 100 copies of his pamphlet printed and distributed these copies to potential customers… Until this time, none of Beardsley’s papers contained any notice of copyright. “Beardsley contends that the distribution of the first edition of his pamphlet was a limited one and hence not a forfeiture of his common-law copyright.” The judge considered that the audience was encouraged to discuss his plan, and that other factors were in play. “Thus, I conclude that as a matter of fact the distribution of the first edition was unrestricted.” The author would have preferred to have established that his second printing had been the first to be considered a publication, as it was the second printing which first included a copyright notice. Continental Casualty was only able to reprint Beardsley’s pamphlet without authorization because they knew of the January 1939 copies not having copyright notice. “The concept of limited publication, it would seem, serves the purpose of permitting authors to submit copies of their writings to associates and acquaintances for criticism without losing their literary property. It also allows authors to give copies to a few of their friends, to submit copies to a very restricted number of potential customers, and to present copies of technical writings along with lectures.” The pamphlet outlined a plan that had already been adopted by three companies, so it was beyond the state of an author soliciting criticism. A model for a sculpture by Pablo Picasso, “The Chicago Picasso,” was publicly displayed at the Art Institute of Chicago starting September 20, 1966. The first of two press showings was held that same day. A notice was posted, “The rights of reproduction are the property of the Public Building Commission of Chicago. (c) 1966. All rights reserved.” Press pictures were taken and the Commission supplied pictures for publication. The Public Building Commission filed its application with the Register of Copyrights on January 12, 1968, and a certificate was issued. By then the model had been displayed without notice, photos were published without notice, postcards offered for sale had no notice, and the monumental edition of the sculpture (of which the model displayed was a reduced-size version) had been dedicated (August 15, 1967). The monumental sculpture bore notice reading “(c)1967 Public Building Commission of Chicago All Rights Reserved”. The Court ruled that it had entered public domain by then. Data Cash Systems, Inc. vs JS&A Group, Inc.
D.B. Goodrich developed a computer game called “Chess One-Move Calculation” for Data Cash. General Instruments Corporation manufactured the ROMs, which were integrated into the game, and marketed from Fall 1977 as “CompuChess.” In June 1978, Data Cash learned that JS&A claimed to be licensed to sell “CompuChess” at a lower price. General Instruments tested the ROM of the competing product and learned that they were identical to Data Cash’s. Over 2500 units had been sold by Data Cash in 1977, but none had a copyright notice anywhere on the ROM, game board, packaging, or instructions. Notice was on internal documents not readable by the public, and not even these were in the code on the chip. (“None was there.”) Data Cash had assumed it was “physically impossible” to make a copy of the ROM yet the infringers were able to “by a technical process of some complexity.” The program was declared to be in the public domain. The “issue is whether the public distribution of a phonorecord without a copyright notice places the underlying musical composition into the public domain. The Court holds, based on the record in this case, that the works at issue are in the public domain… . “Plaintiffs have filed a complaint for copyright infringement of forty-two musical compositions.” Only six were decided in the motion, those being ones “the defendants believe are representative of certain legal issues common to all forty-two works… . “Defendants claim that four of the musical compositions are in the public domain because plaintiffs published the works by distributing phonorecords that did not contain a copyright notice… . Plaintiffs do not dispute the fact that the phonorecords were sold to the public without copyright notices. Plaintiffs, however, dispute the legal significance of the absent copyright notices.” All four songs are from 1958 to 1967, thus ineligible for protections afforded by later versions of the Copyright Act. After determining that a phonorecord is different from a copy, the Court examined the differing opinions concerning lack of copyright notice on a phonorecord reached by the Second and Ninth Circuits. The Court accepted the view that put the compositions into the public domain. Billboard magazine once had “Apartment #9” at position #9 and “How Fast Them Trucks Can Go” at #12. Sieff, et al., dba S & M Tire & Auto Supply Co. vs Continental Auto Supply, et al. (launch this) concerned successive editions of a catalog, some issues of which lacked copyright notice. The publisher sought to enforce copyright in the parts reproduced from earlier, copyrighted catalogs. Esther Larose Harris vs Coca-Cola Co. (launch this) litigated over unauthorized reproduction of illustrations from the second book edition of the Uncle Remus stories. The lack of copyright notice on the first publication of the stories was discussed in the verdict.